Volunteers from Blackbaud, Communities in Schools and the St. Johns Interact Club spent September 11, 2009, helping to beautify St. Johns High School. Military cadence calls echoed off the brick walls of St. Johns High School on the morning of September 11. The school troop was in full uniform, marching from one end of the parking lot to the other, rehearsing calls and formations in preparation for the ten o’clock ceremony. In the grassy front lawn of the school, a collection of red, yellow and white t-shirts flitted about between broad lengths of blue tarp and several piles of landscaping gravel and mulch. Of the three colors, two were volunteers. The nine men and women in red shirts were volunteers from Blackbaud, while the three or four yellow shirts were from Communities in Schools. The white shirts were 15 plus students from the St. Johns High School Interact Club, and they were all doing their part to participate in that day’s national Day of Caring. Although Trident United Way has been celebrating the Day of Caring since 1992, and unofficial Days of Caring have been held on September 11 for several years, this year marks the first officially-designated National Day of Service and Remembrance. In honor of the day, tens of thousands of people in all 50 states volunteered their time in the community, doing everything from building rabbit hutches at local animal shelters to volunteering at soup kitchens to helping at local schools. At St. Johns, the volunteers spent the morning decorating and filling a couple dozen planters and painting short white lengths of picket fence to be placed in various sunny nooks around the school. Others took up shovels and began digging out the star-shaped pattern of the school’s football team, the Islanders, in two central places in the school’s front lawn. 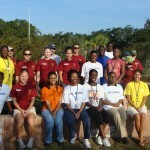 The Interact Club came up with the ideas, but they could never have been completed without the help of the community. The flowers for the planters were donated by the president of the St. Johns Rotary Club, Mauricio Esperanza, and with his help the school was able to purchase the gravel, mulch and flower boxes for the various projects at deeply discounted prices. As the ceremony concluded, students returned to classrooms and volunteers wrapped up their projects, looking forward to the full lunch prepared by the school’s culinary art students. However, the solemnity of the ceremony still clung to students and volunteers, evident in the unusual quiet in the halls and project areas.